Mercedes-AMG SLC 43 gets a new light or dark aluminium trim parts with carbon fibre finish. The instrument cluster has a new design too and the two tubular instrument cluster surrounds now feature black dials. The red needles also add to the sporty and contemporary design. Beside this the gets a 4.5-inch screen with a whole lot infotainment options and Mercedes-Benz apps.Mercedes-Benz India today rolled out the its 6th product this year – the Mercedes-AMG SLC 43. The open top two-seater comes priced at Rs 77.50 lakh (ex-showroom, Delhi).20 years after the birth of its segment, the roadster gets a new avatar and name. It was at the 2016 Detroit Motor Show that the company introduced the world to the SLC and within six months of its global premiere, the car comes to India, which shows how aggressive the German carmaker is when it comes to expansion of its product portfolio. The SLC 43 replaces the ageing SLK 55 AMG and it’s not just the name that’s changed – the facelift gives us a fresh/modernized version of the SLK. Like nearly every other recently redesigned Mercedes-Benz model, the AMG-tuned SLC arrives with minor, albeit noticeable changes. Up front, the most visible of the changes were applied to the headlamps, grille, and bumper. Although the headlamps are similar to the previous unit as far as shape and size go, the light cluster is new, with the arrangement similar to the C-Class. The previous grille was replaced by a diamond pattern piece, a feature that has become standard for most Mercedes models in 2015. However, the SLC43 didn’t receive the fancier twin-blade grille insert of the S-Class Cabriolet. Down below, the roadster sports a brand-new bumper employing the brand’s new “A-wing” form. The horizontal slats on the sides are significantly larger, as is the silver chrome splitter. Overall, the SLC43 is a lot more aggressive than its predecessor and that menacing bumper is the main culprit. Significant modifications were operated around back as well. While the trunk lid remained unchanged, the taillights gained new LED clusters with the reverse lights mounted at the bottom (the SLK55 model had them at the top). The bumper is also new, featuring vertical side intakes, a new diffuser, and smaller, but better integrated exhaust pipes. Also, the bumper’s main character line is no longer slightly V-shaped, but straight from one corner to the other. The side view is highlighted by high-sheen, 18-inch AMG wheels, high-gloss black mirror caps, and silver chrome fins for the front fenders.Customers who want a bespoke roadster will have a access to several options, including red-painted brake calipers, headlamp eyebrows, several 18-inch wheel and tire combinations, and Designo paint finishes. The SLC interior bears a strong family resemblance to the layouts of both the SL and (other than its unique center stack), the AMG GT sports car. Although the SLC is by far the least expensive car of the three, you’ll be hard-pressed to see where Mercedes cut costs. The buttons, switchgear and COMAND infotainment interface are virtually identical to what’s offered throughout much of the Mercedes lineup, so SLC drivers will never feel like second-class Benz buyers.One element shared with the SL is the distinctive glass roof panel that provides sunshine even when outside temperatures keep the roof up. Unfortunately, there’s no retractable sunshade, and the only protection you get from a glaring sun is a light tint. In lieu of perpetually wearing a hat, we strongly recommend springing for the optional Magic Sky Control feature, which darkens the glass at the press of a button. It seems silly to get a retractable-roof roadster if the roof isn’t able to block the sun. Retracting the roof into the trunk (an entertaining sideshow in itself) uncovers a cabin that remains pleasantly calm at speed, aided by the standard fixed-glass deflector. Another feature that Mercedes pioneered is the Airscarf system, which blows warm air at neck level from clever seat-mounted vents. In the summer, meanwhile, the available sun-reflective leather guards against scorched skin, and it also slows the leather’s aging process.The main interior drawback for the SLC is that it’s quite snug, even by compact roadster standards. The Z4, for example, gives larger drivers more room. On the bright side, the trunk is surprisingly accommodating for a two-door car whether the roof is up (10.1 cubic feet) or down (a still useful 6.4 cubic feet). Having an engine with the capacity of 3.0 litre, the Mercedes – Benz AMG SLC 43 specifications include a power output of 367 bhp and a torque of 520 Nm. This engine saves up to 20% of the fuel consumption in comparison to the predecessor while the CO2 emissions produced by it are lesser. The 6-cylinder power train has the typical AMG driving performance while the refinement in driving can be felt across the entire engine speed range. The 9G tronic automatic transmission further ensures efficiency and comfort for the passengers. Gear changing with the 9G tronic system is fast as well as pretty smooth. Mercedes – Benz AMG SLC 43 mileage should be around 11 kmpl but in actual conditions, one can expect a lower figure. 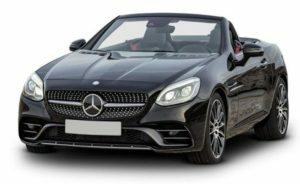 Also, when one buys a car like Mercedes – Benz AMG SLC 43, mileage is not the concern, rather it is the performance of the car that is way more important, and in terms of performance, the Mercedes – Benz AMG SLC 43 2016 is quite impressive. The SLC goes like an AMG should but the SLC’s soundtrack doesn’t have the traditional bass, burble and growl of the big AMG V8’s. Still, the rasps and snarls from the exhaust are angry, wholesome and very likeable. The sports exhaust also lets out pops and crackles that add greatly to the background score. Of course, the SLC sounds its best in the sportiest of its driving modes. There are five driving modes to choose from but Sport and Sport+ with the ESP set to sport handling are where you want to be for max fun. In addition to powertrain characteristics and the exhaust note, steering weight also changes with each mode. Mercedes has reworked the steering and suspension for the SLC and the changes have done their bit to enhance the overall driving experience. There’s more front-end bite, the steering is more responsive to inputs and in general, the SLC is more attentive to where you want it to go. Is it the most dynamically sorted of the convertibles in India? Probably not. Is it fun? Definitely yes.Fun as it is on a quick drive, the SLC also works surprisingly well in everyday conditions. Ground clearance, for one, is sufficient for average-sized speedbreakers. This is an AMG so the ride is on the firmer side, but again it’s not back-breakingly bad. But on the rough stuff, you can tell the SLC 43 isn’t the most rigid of convertibles around. It doesn’t feel as tight as something likeMercedes Benz Amg Slc 43 Std Ex-showroom Price is 82,18,632/- and On Road Price is 1,02,54,859/- in Bangalore. Mercedes Benz Amg Slc 43 Std comes in 1 colours, namely tem with reversible belt tensioners. Whenever emergency braking is detected the brake assist system with brake servo assistance help with effective braking.The Mercedes-AMG Dynamic Select offers five selectable drive modes – Eco, Comfort, Sport, Sport+ and Individual. The roadster also gets the AMG sports suspension system that makes it a sheer impressive performer. The infotainment system supports Apple CarPlay and Android Auto system. Moreover, the Garmin MAP Pilot makes navigation an easy task. There are no shortage of opinions on the subject of whether the twin-turbocharged six is a step backwards compared to its V8-powered predecessor but the bottom line is you’re getting virtually the same performance with lower fuel consumption and emissions…and that can’t be bad.OK we’ll concede the wonderful exhaust note of the SLK 55 will be missed but progress is progress and by any measure the latest Mercedes-Benz roadster continues the tradition of its glorious predecessors.Two-seater retractable hardtops are by definition selfish cars so if you’re going down this road you deserve the luxury, sporty dynamics and street appeal which are the hallmarks of AMG.